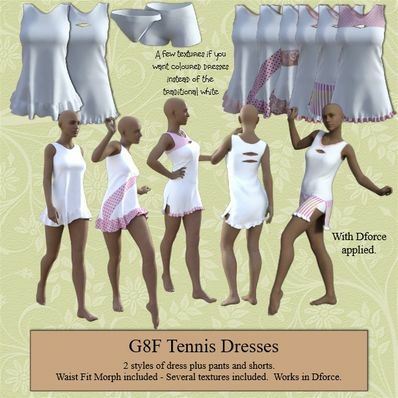 I'd like to ask, is there a free tennis outfit for Genesis or any of its subsequent versions? No I haven’t made any tennis dresses as yet. You can any of the commercial fitting tools, or just manually parent and use dforce, perhaps? Thanks again! I think this one exploded with dForce. I ram a sim, went and did something else, when I returned, she was naked, LOL! Anyone else try dForce on this yet? IMy PC is being upgraded so I am working on my laptop which can’t use dforce so couldn’t try it out I’m afraid. Edit: Oops! Saw that you need to fix the missing files. Files have been updated. Hope I've fixed all mistakes. Thanks Frank. Strange that it loads the texture anyway. Will look at it later as I,m off out soon. Wow, very nice thank you!!! Thanks for such an amazing Dress Wendy! How were you able to have the model sit in the dress? Sorting out the problem with the certificate. Please be patient while this is being fixed. Thank you. I've used dforce on Wilmap's cothes; generally they work well enough. I haven't tried it on that particular but I'll give it a quick go and get back to you. Something is affecting the dforce, so certainly not straightforward. Could be the frills, or could be the pose and could also be both. I agree. 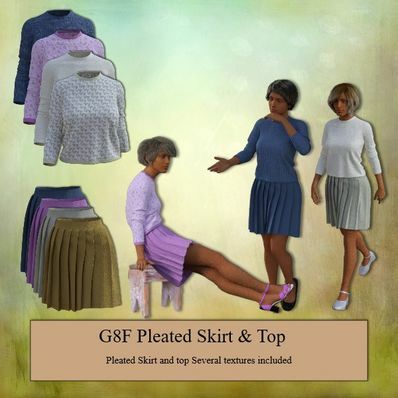 I was looking through my collection and I saw the G2F elegant dress. I'm so impressed with ever fold and ever nuance of design. It is really really beautiful. Thank you Wilmap.